The clocks have gone forward and spring has officially sprung! Whilst horsemen and women have sworn by the benefits of ‘Dr Green’ for generations, it’s not without its pitfalls. Knowing the facts can help you decide on the most suitable management for your horse this spring. Ponies have been seen to consume almost 5% of their bodyweight (dry matter) in grass per day which for a 500kg horse, would equate to a staggering 25kg. In spring, this could easily provide three times the published energy (calorie) requirement for horses and ponies in light work! Grass contains a combination of simple sugars (produced in daylight hours via photosynthesis) and fructan, the storage form of sugar found largely in the stem. High intakes of sugar and fructan, collectively referred to as ‘WSC’, can lead to colic, insulin dysregulation, laminitis and weight gain. 3. WSC levels are hard to predict! Although always high in early spring, levels of WSC can fluctuate hour by hour making it hard to predict when it might be ‘safest’ to turn out. Sunlight, fertiliser application, temperature, soil fertility and grass species can all have an effect but in general, factors that encourage growth but limit photosynthesis will help to reduce WSC. For example, shaded pasture in combination with warm temperatures, sufficient soil moisture and appropriate fertiliser application. Grass can contain up to 7.5% simple sugars which means a 350kg pony could consume 1.3kg per day from grass alone, the majority of which is sucrose – the same sugar you put in your tea and the main form of sugar in molasses. However if you add fructan into mix, total WSC intake could rise to almost 9kg! 5. WSC levels may still be high at night! Provided the weather is warm enough, fructan stored in the stem is used for growth overnight. This, in addition to the fact that grass can’t photosynthesise without sunlight, means that WSC levels will be lower at night. However in order for grass to grow, the soil temperature needs to be consistently above 5°C which means on chilly nights, WSC levels may still be high. Sunny frosty mornings are common at this time of year and present a hidden danger for laminitics. When it’s too cold for the grass to grow overnight, WSC levels remain high. When the sun comes out this is coupled with photosynthesis and further sugar production, resulting in high levels of WSC. Although turning out for short periods may seem like a logical way of restricting grass intake, our four-legged friends can soon become wise to such a regime. In one study, ponies were seen to consume almost 1% of the bodyweight in only 3 hours at grass, despite being fed ad lib hay for the rest of the day. For horses and ponies on a strict weight loss diet, this could equate to two-thirds of their total daily forage allowance. 8. Do grazing muzzles really work? Grazing muzzles have been shown to reduce intake by an average of 77% in ponies turned out for 3 hours, and reduce the rate of weight gain when worn for 10 out of 23 hours at pasture. However results vary between individuals and in some cases, horses and ponies may still gain weight when wearing a muzzle for part of the day. Grazing muzzles may also lead to frustration so monitor your horse’s behaviour, weight and body condition score closely. Prolonged use of a muzzle may also cause the horse’s teeth to wear unevenly so ensure they are checked regularly by a vet or equine dental technician. Rapid growth makes spring a particularly high risk period for laminitics and for very susceptible horses and ponies, complete removal from grazing may be the only option. In these cases grazing should ideally be replaced with a low WSC hay or an appropriate hay replacer. 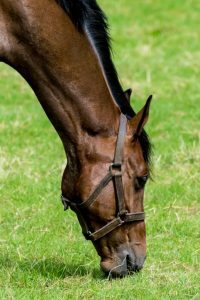 For advice on managing your horse’s grass intake contact the SPILLERS Care-Line on 01908 22 66 26.